I found squash blossoms at the Union Square Greenmarket the other day, along with a glut of every other late-summer delight! I'm telling you, there is no better time of year to eat than right this moment, when there is such an abundance of in-season, interesting and delicious produce. 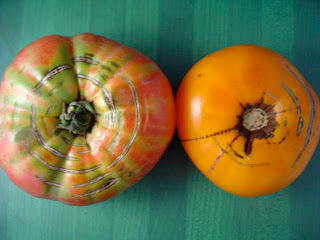 If you don't think you like tomatoes, it might be because you're used to the watery, pallid, out-of-season tomatoes (that ubiquitous member of the iceberg-lettuce-and-cucumber side salad). But at the farmer's market, you can get tomatoes so sweet, and with such a depth of flavor, that you'll be forever converted. Back to the blossoms. I had never actually eaten a squash blossom, but I'd heard about them, and they'd been lurking vaguely on the fringes of my mind. Anyway, I'd heard enough about them to feel confident that I'd find a good recipe, and positive that I wanted to try. Something told me that this was just the kind of thing Judy Rodgers might have included in Zuni, so I started my search there. Breading and frying squash blossoms is the usual preparation for them. In her recipe for Mozzarella & Corn-Stuffed Squash Blossoms, Judy Rodgers simply provides an idea for a stuffing, but doesn't get into the technicalities of the frying. Rodgers gives no exact measurements, but you really don't need any, because this is more about assembling. It's important to realize that this recipe calls for raw corn kernels, and the only really acceptable raw corn kernels are those that come from very very young corn. 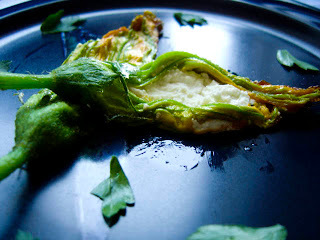 Spread the petals of each squash blossom and tuck a few small diced pieces of mozzarella and a spoonful of corn kernels inside. Gather and twist the petals together in order to hold the filling in. At this point Rodgers says to "bread as usual" and then "fry." 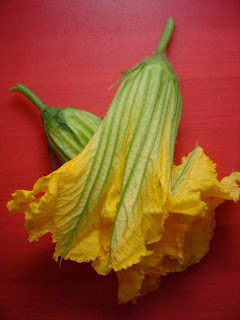 In Chez Panisse Vegetables, Alice Waters gives a clear description of the breading and frying process (coming up after a short interlude about fillings) in a recipe for a stuffed squash blossom sauté in which the blossoms are stuffed only with mozzarella. Boni says simply to "make a stuffing" with the above ingredients. 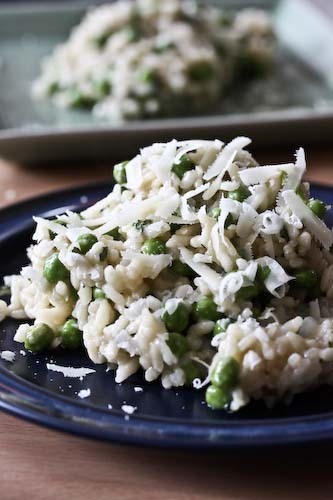 She also says that a stuffing sometimes consists only of "a little anchovy and a few cubes of Provatura or Mozzarella." Just for authenticity's sake, Boni gives instructions for a deep fry which includes making a "simple batter with 4-5 tablespoons flour and enough cold water to make a thin paste, the consistency of cream." The blossoms will be dredged in the flour, and then deep fried. I however, prefer a shallow fry. And that's where Ms. Waters comes back in. Waters suggests quickly dipping each blossom individually into a beaten egg, then into fine corn flour or masa harina, but you could also use flour. She says to shallow fry the blossoms in hot olive oil, turning once. Drain them on paper towels and serve immediately, perhaps with a little lemon, as Mark Bittman suggests in How to Cook Everything Vegetarian. 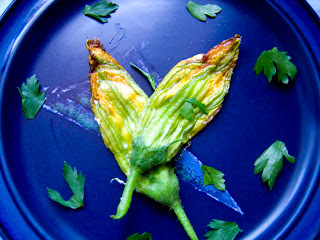 Bittman cautions that squash blossoms take very little cooking, so they should be fried at a high heat (375 F), for about 4 minutes total, just enough time to turn the exterior golden brown. If you don't have a thermometer, or would just rather concentrate on what the oil looks and sounds like than on a read-out, Rodgers describes the temperature of the oil for a shallow fry in her picada recipe. The oil is hot enough when it sizzles just a bit as bread is dipped into it. You could use a small piece of crust to test. Anyway, all of this is well and fine, but I found myself with a bit of leftover ricotta and some fresh thyme. I think that sounds like a fine stuffing and saves me a trip to the grocery store. So for the blossoms you see in the image, that's what I used, along with Waters's process for frying.